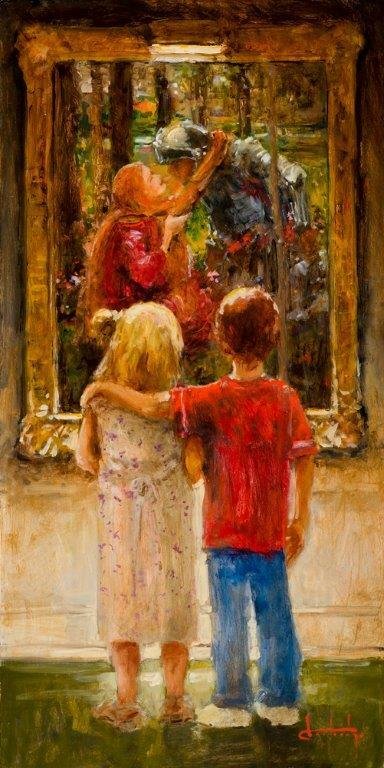 Young Knight| Painters Chair Fine Art in Coeur d'Alene, Idaho features original paintings, sculpture, prints and much more. Romance can be valiant, especially for elementary levels. This is a piece of the Museum Series where I get to paint classics in my style with a story happening in front of them. Norman Rockwell did it a lot. In this case, the young knight and his maiden are pausing before the school bus leaves to go home.